Imagine a situation where your data set is divided into different categories, subcategories,price ranges, and things like that. What if you would like to n ot only get information about counts in such a group (with the use of faceting), but would also like to show the most relevant documents in each of the groups. The result contains single topmost document from each group.If if you want to get more than one document from each group, then append &group.limit in the above query as shown below. This query returns maximum 10 documents from each group. Sometimes grouping results on the basis of field values is not enough. For example, imagine that we would like to group documents in price brackets, that is, we would like to show the most relevant document for documents with price range of 1.0 to 19.99, a document for documents with price range of 20.00 to 50.0, and so on. Imagine that you would like to group results not by using queries or field contents, but instead you would like to use a value returned by a function query. To group documents on the basis of their distance from a given point. group Boolean If true, query results will be grouped. group.func query Group based on the unique values of a function query.NOTE: This option does not work with distributed searches. group.query query Return a single group of documents that match the given query. rows integer The number of groups to return. The default value is 10.
start integer Specifies an initial offset for the list of groups. group.limit integer Specifies the number of results to return for each group. The default value is 1.
group.offset integer Specifies an initial offset for the document list of each group. sort sortspec Specifies how Solr sorts the groups relative to each other. For example, sort=popularity desc will cause the groups to be sorted according to the highest popularity document in each group. The default value is score desc. group.sort sortspec Specifies how Solr sorts documents within a single group. The default value is score desc. group.format grouped/simple If this parameter is set to simple, the grouped documents are presented in a single flat list, and the start and rows parameters affect the numbers of documents instead of groups. 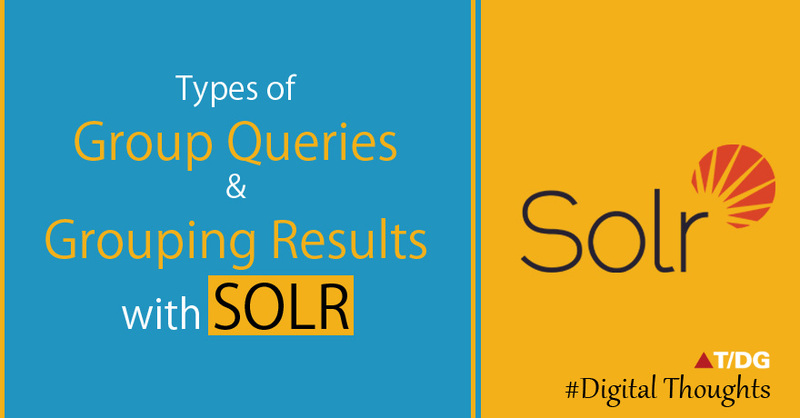 group.ngroups Boolean If true, Solr includes the number of groups that have matched the query in the results. The default value is false. group.truncate Boolean If true, facet counts are based on the most relevant document of each group matching the query. The default value is false. Currently group.func is not supported in any distributed searches. group.ngroups require that all documents in each group must be co-located on the same shard in order for accurate counts to be returned.